Well hi there. To start this blog a rollin’ I thought I’d do two things: number 1, explain my approach to vegetarianism and number 2, explain a little of what I am currently trying to do food-wise. 1. A lot of vegetarians like to use various things to take the place of the meat in their food, such as mushrooms, tofu and/or other soy products. However, since I never really cared for meat in the first place (and therefore don’t miss it) my approach to food is generally to just take the meat out. 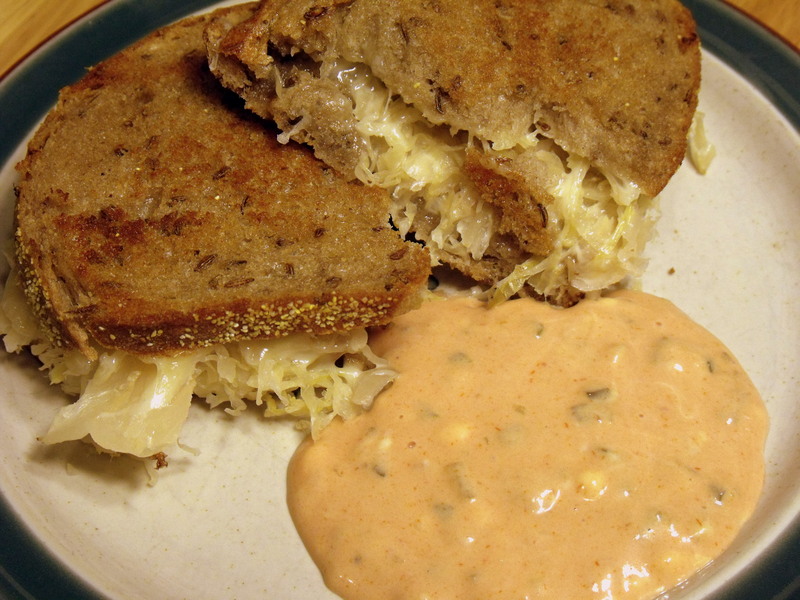 For example, last night we had Reubens for dinner, my husband had the traditional swiss cheese, sauerkraut, and corned beef on rye bread, and Brenda and I just had the same thing minus the beef part. Sometimes it takes a little more creativity than that, but you eventually get used to it. 2. My goals as far as healthful, nourishing, balanced eating are as follows: keep my protein intake up, make veggies the center of my diet, eat less of and a larger variety of grains, eat less in general (aka the appropriate amount), eat a better breakfast, incorporate more raw foods, and eat mainly whole and homemade foods. I’m also trying to exercise 5-6 times a week. I am always reading about food and nutrition, so I’ll update and elaborate as I’m pondering different ideas. Over the next few days I will be posting some of our staple foods and meals. These are the things that we love to eat, yet are also easy to make. These foods are great if you are just starting out as a vegetarian or if you simply want to incorporate more vegetarian meals into your diet. Hopefully they’ll be of some interest. One last thing. I just want to throw this out there – I love food. I love making it and even more so I love eating it. It is my very strong belief that food that is “good for you” should also taste good… if not better than food that is not so good for you. And on that note.. we move forward.